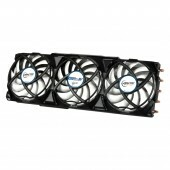 With a cooling capacity of 300 Watts, the Accelero Xtreme IV offers an unmatched cooling performance. 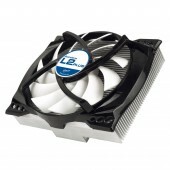 The three 92 mm PWM fans and the pre-applied MX-4 thermal compound ensure efficient cooling, even under overclocking. The Accelero Twin Turbo III has 250 Watts of cooling capacity which is more than enough for mid to high-end graphics cards. ARCTIC´s patented backside cooler, the MX-4 thermal compound (pre-applied) and two 92mm PWM fans lower the GPU temperature significantly- ideal for overclocking. The Accelero L2 PLUS features a 92 mm PWM fan, a cooling capacity of 120 Watts and pre-applied MX-4 thermal compound to deliver excellent cooling performance. In a test by HardwareBG, it lowered the temperature of an overclocked AMD HD 6850 by a whopping 20 degrees.